[as] > AEC CAD/BIM > Revit’s solar study has evolved! Turns out Autodesk’s purchase of Ecotect does not limit their offerings to one additional piece of software. It even sprouts some very useful off-shoots. A first glimpse at new energy-integrated planning tools offers the recently released Solar Radiation Technology Preview for Revit Architecture and Revit MEP. This software, which has been published on the Autodesk Labs site, runs as an add-on in Revit Architecture or MEP. It is actually a (by Autodesk’s standards) rather small software package at under 5 MB. But then again, Ecotect is also (still) comparatively small (34 MB vs. Revit’s 1.5 GB). 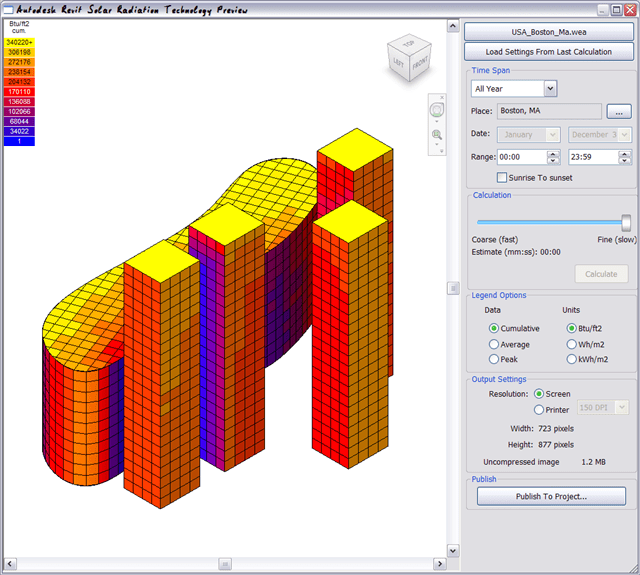 Featuring an easy to use dialog that is not much more complicated than the rendering dialog in Revit, this technology preview can perform fast solar radiation calculations on conceptual massing models. Although the image above shows an analysis of the full model (all five buildings), it is possible to assign “shading-only” status to surfaces or entire objects. This cuts down on calculations and simplifies presentation. While taking the classic shading analysis in Revit one step further, this tool can help in shaping buildings as well as siting solar panels. And if a more detailed exploration of the results is desired, then Ecotect simply waits in the wings.